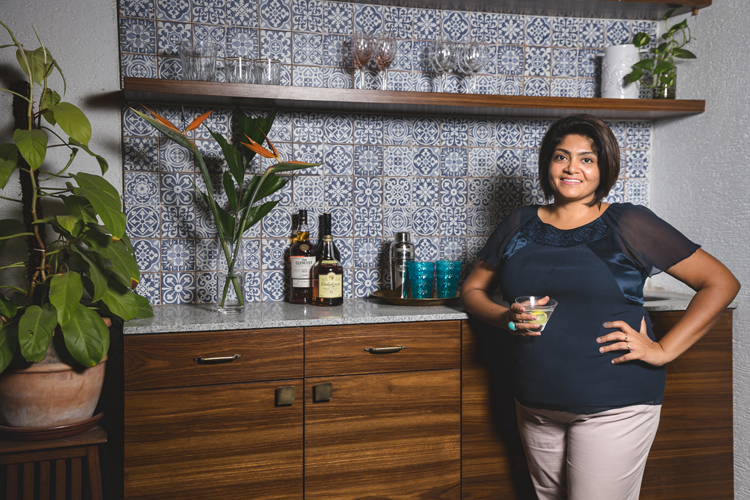 Bringing a beautiful home to life – A modern take on old world charm! This renovation was all about marrying the modern and updated aesthetic of a young modern family with their love for the old world and traditional! 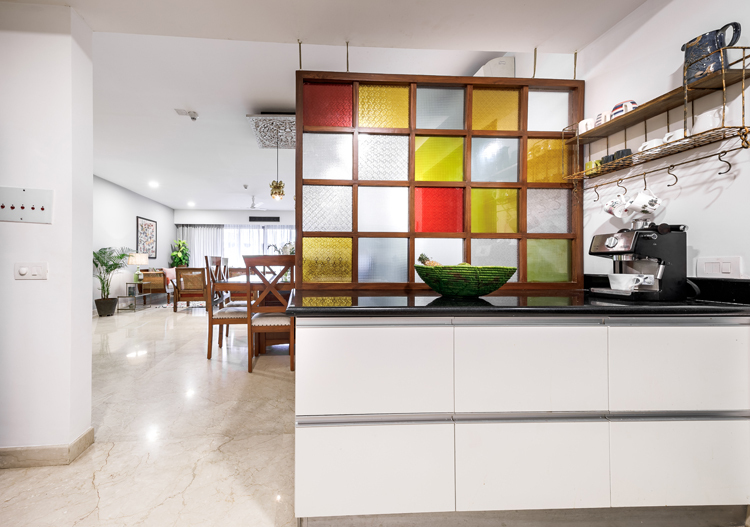 What started off as a small project of adding a partition to an open kitchen and creating a coffee station went way beyond that and truly was an update of almost the entire home! 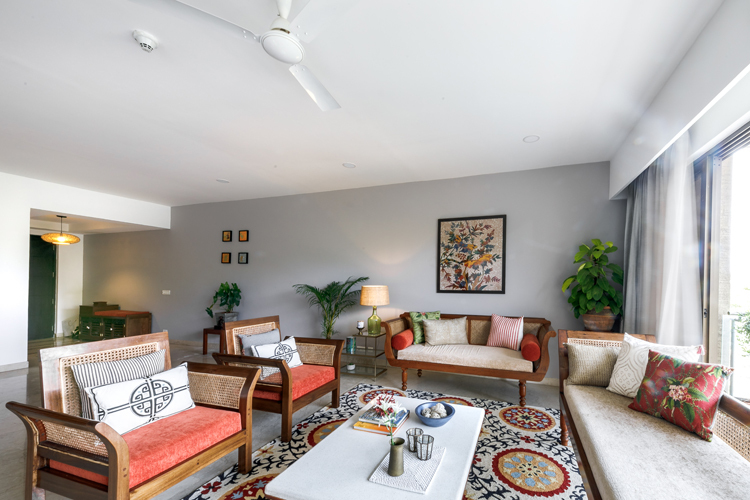 I am so proud of how we managed to bring in an updated fresh and young vibe to this home filled with character pieces! 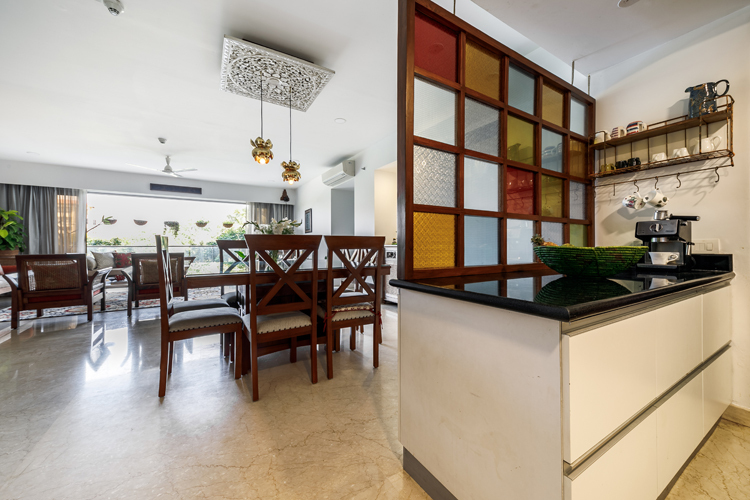 Our key project was to create a partition between the open kitchen counter facing the living dining area and offering some privacy while the kitchen is in use. While we could have done a glass partition or a sliding door or even a lattice screen, I thought something more unique and in line with the old world charm they loved would be great! 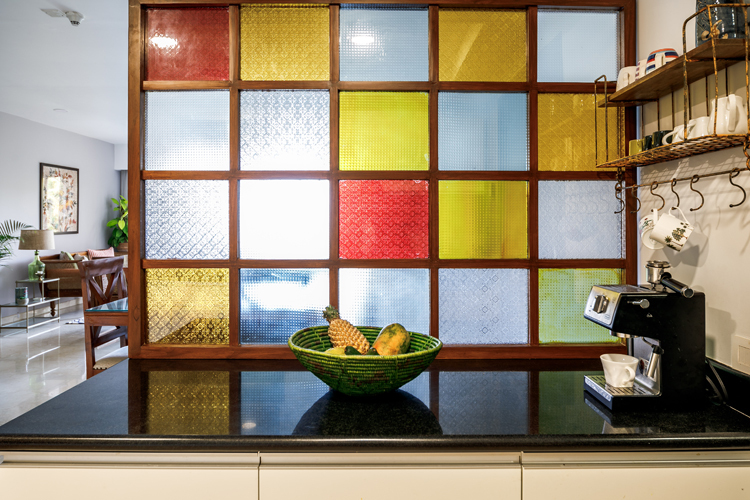 Like a drop down/ hanging window frame with colored glass pieces almost reminiscent of an old house window that had been repurposed! We initially wanted to use tiles on the screen but due to the weight of tiles we settled for glass. It was something that the clients loved, but being a unique custom piece execution was key! After many sketches, pinterest pictures, whatsapp messages, hunting for etched colored glass and three iterations to get the right finish and colors, we finally had what we set out for! Behind the screen we created a lovely coffee station supported by a vintage looking wall shelf from Fabuliv. 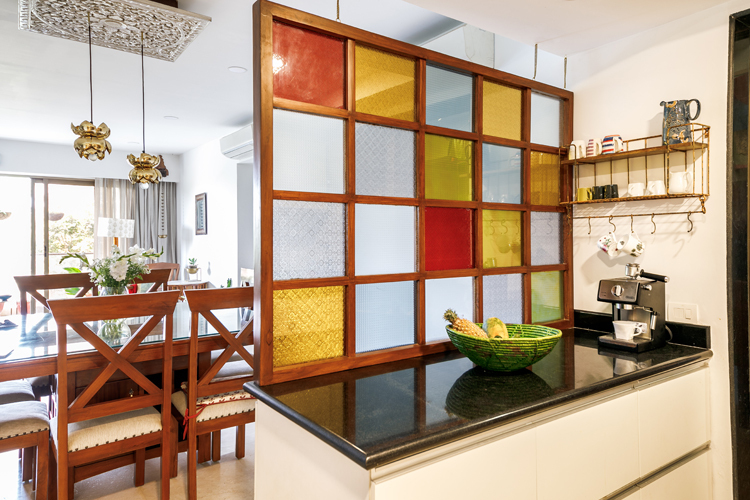 Teak finish framed, vintage glass screen window suspended from brass chains was now the screen that we dreamed of! Originally made to create privacy and now something that’s a piece of art in line with the rest of the home! Here are some pictures! 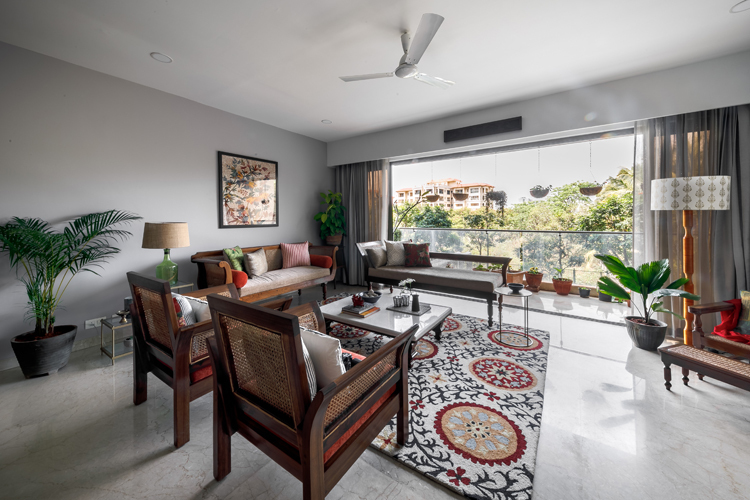 The next ask the client had was to create an area in the terrace where they could make and enjoy their morning coffee and also entertain in the evenings. I loved the idea of a wet bar with a sink because it serves both purposes and is a great way to entertain with drinks and cocktails. 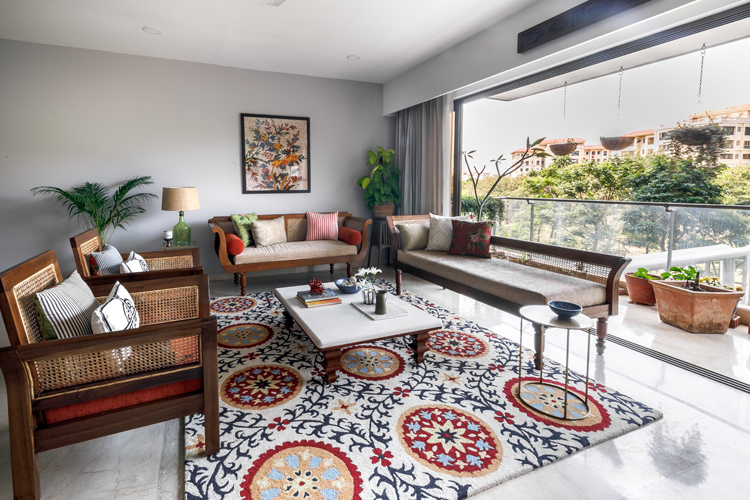 Once we decided on this, I thought this might be a great spot to incorporate those chettinad / patterned tiles my client loved. 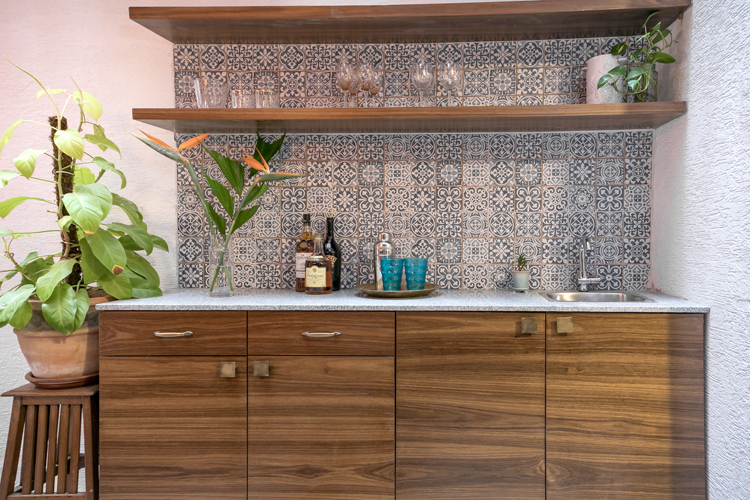 So we designed a beautiful backsplash with patterned tile that now became the feature of this beautiful bar unit! 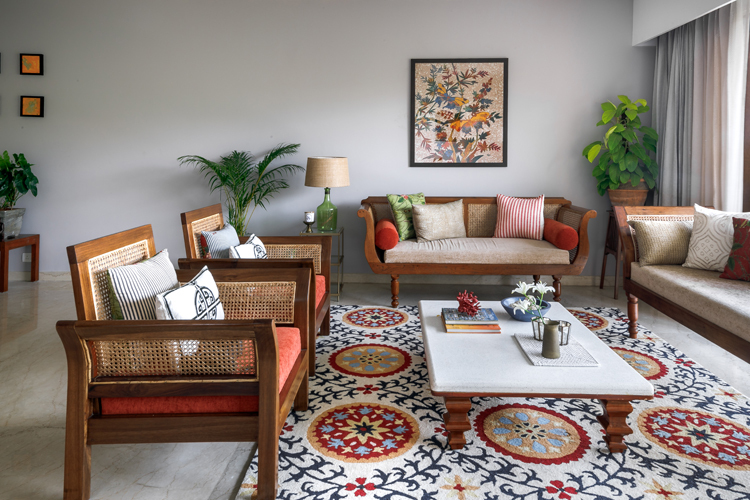 We picked a beautiful blue and white Spanish patterned tile that complemented the warm oranges and mustards used in the rest of the terrace so beautifully. 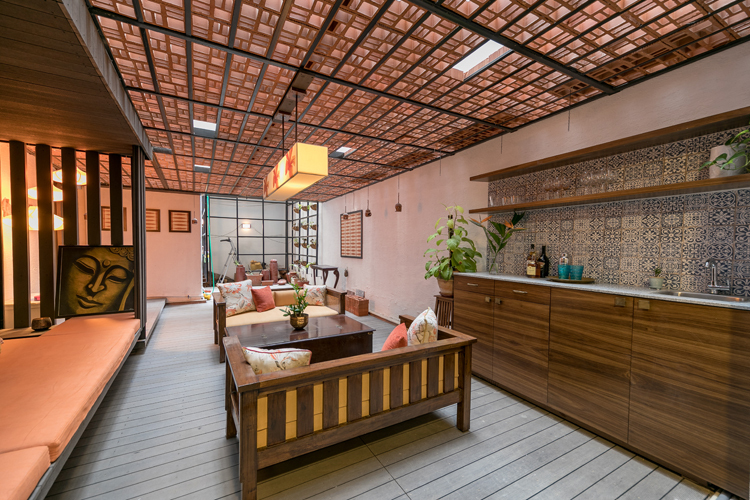 This is probably my favorite transformation in this project and totally completes the terrace! 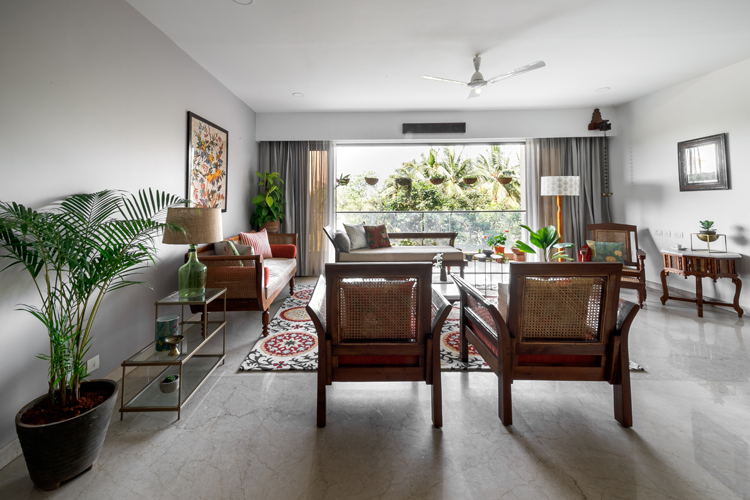 We also started working simultaneously on the large living dining area that already had a lot of large teak furniture pieces but didn’t really have a story or a vibe. My job here was rather challenging, having to work with large pieces of existing furniture that were all beautiful but one too many of the same style. 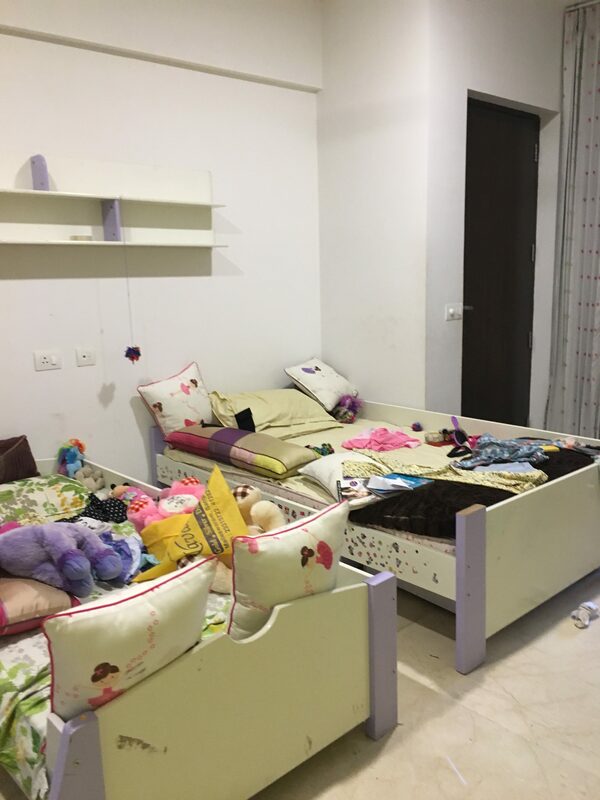 So the challenge was to create a story and break the monotony of the furniture. 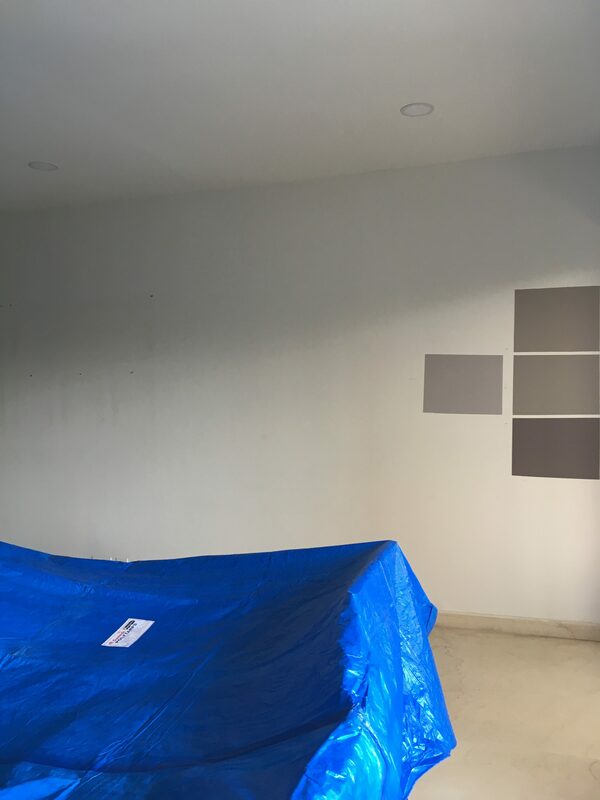 We decided to paint one of the large walls a warm grey which took a lot of discussions and going back and forth;) but worked out so well in the end! 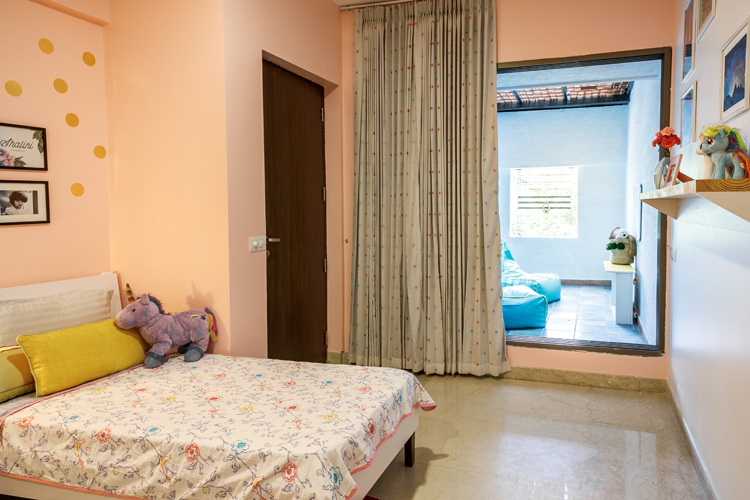 We chose smoky grey from Asian paints and it does a great job of bringing in that warmth and grounding the space. Here’s a look at the before! A look at what it looks like now! 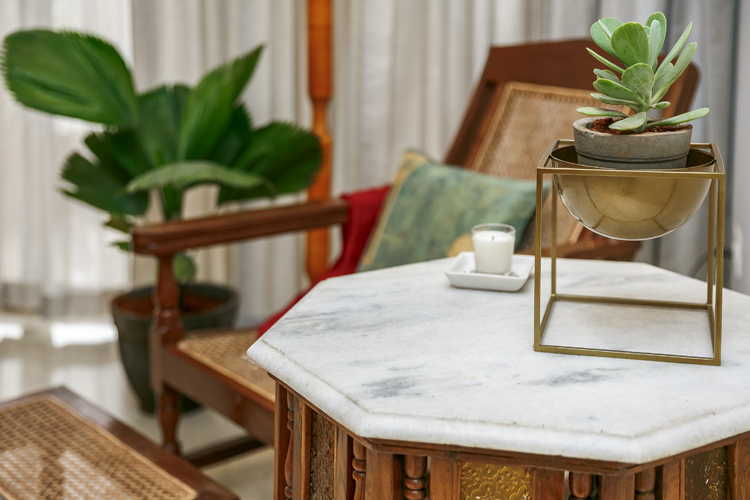 We added corner tables in brass and glass to lighten up the space but still add some glam and shine from Asian Arts and Lohasmith, accessories like a beautiful green lamp from Fabuliv and some smaller accents. 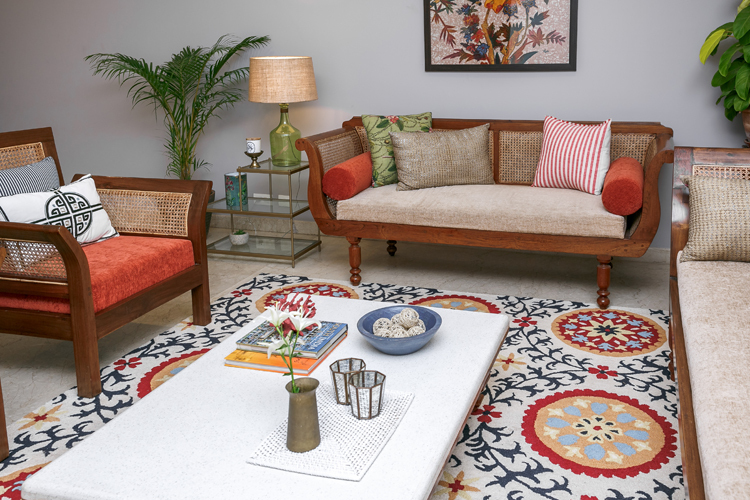 We rounded off with simple modern pillows from Nicobar blended with some vibrant patterned ones from Good Earth. 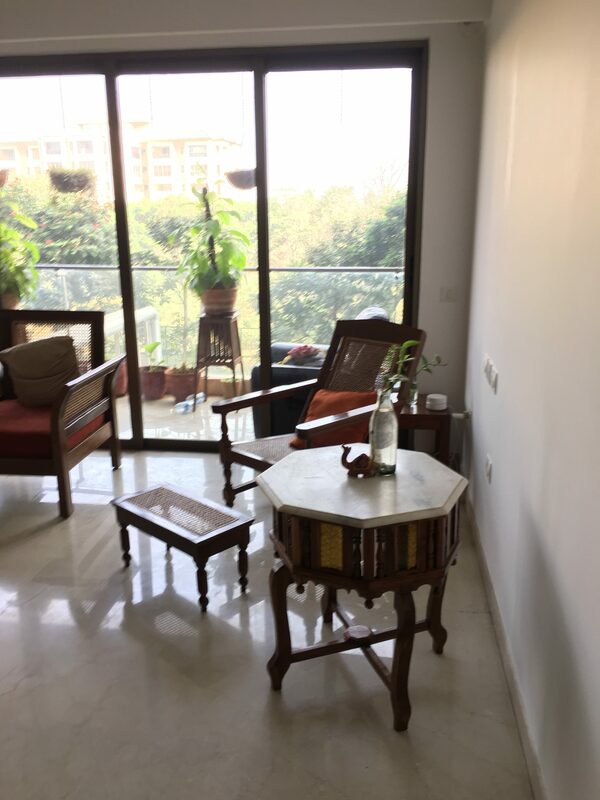 We also broke down the large space into two distinct areas to create visual balance and created a reading nook in the far end with a planters chair and a marble top table the client already had! 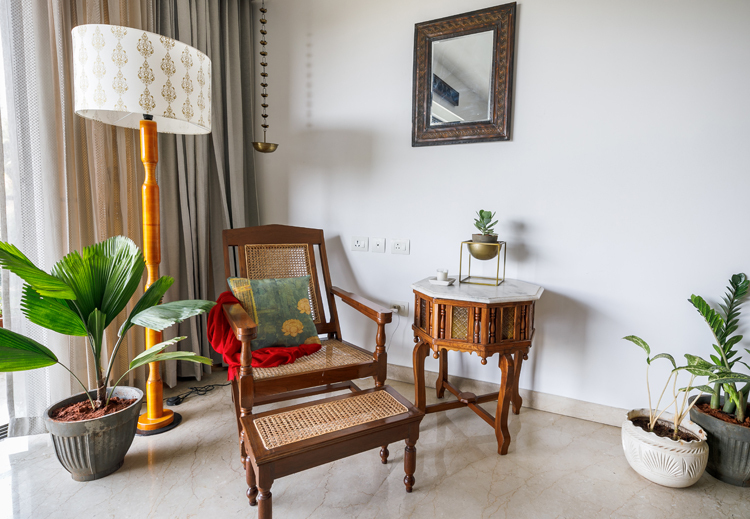 We added a simple floor lamp with a mustard base and white shade from Purple Turtles and used small accessories like a chic planter from Nicobar and vintage wooden brackets and hanging lamps the client had. I love the charm this little spot brings to the space! 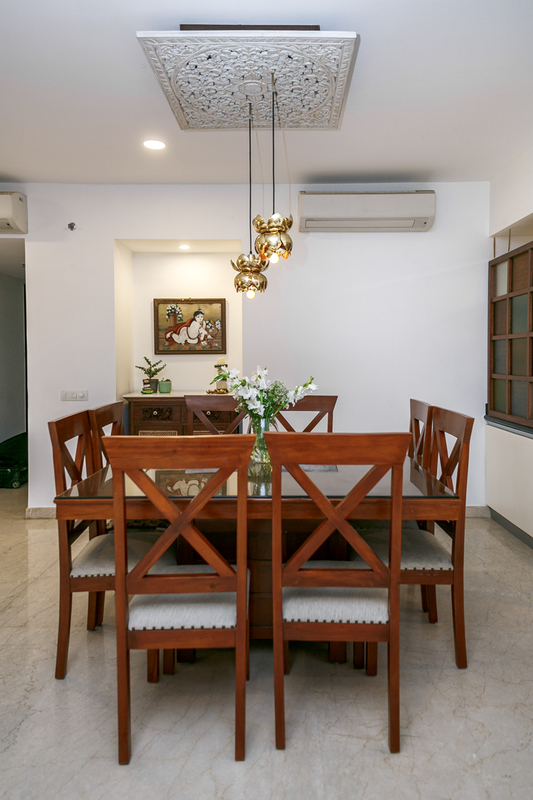 The dining area already had a large dining set and we just added two brass lamps suspended from a ceiling panel that the client already had. I love the way the brass lamps look against the glass screen in the background! 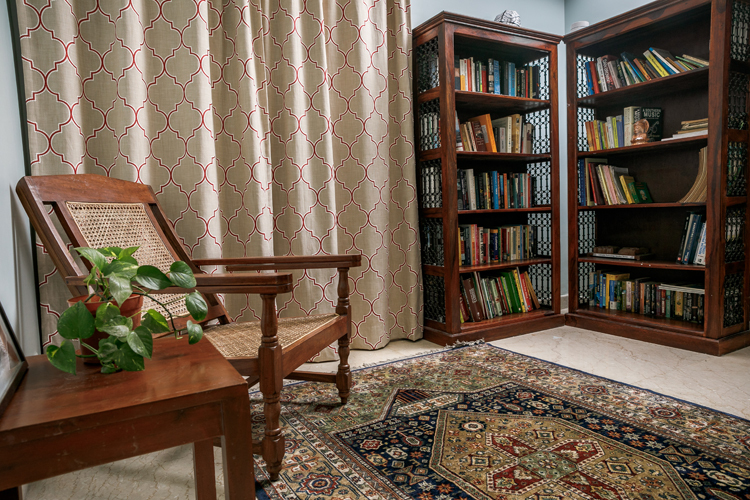 We also refreshed the study room by working with the furniture the client already had and a beautiful navy rug. 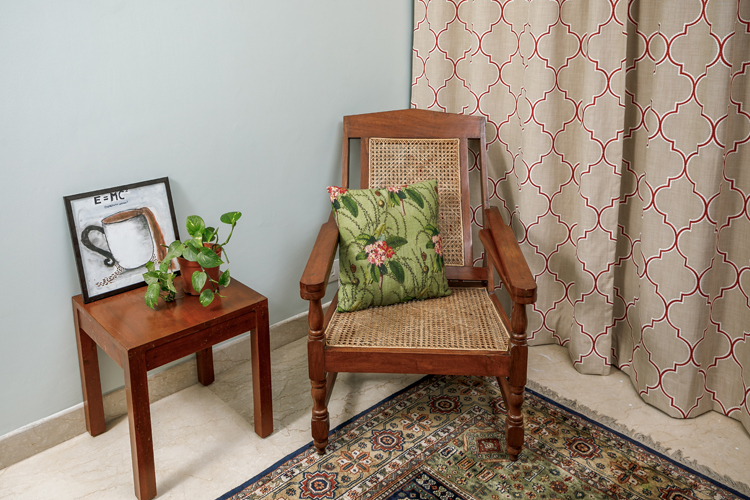 We chose to paint the walls a pastel seafoam (ocean cliff from asian paints) to complement the rug and added curtains in a Moroccan tile pattern in beige and rust. 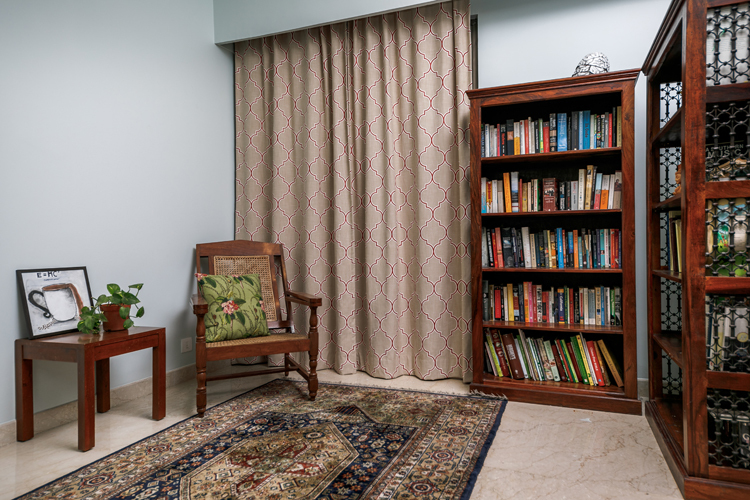 One of the very simple things we did that changed the feel of this room was to put the two large bookshelves next to each other in a L pattern to create the feel of a little library! 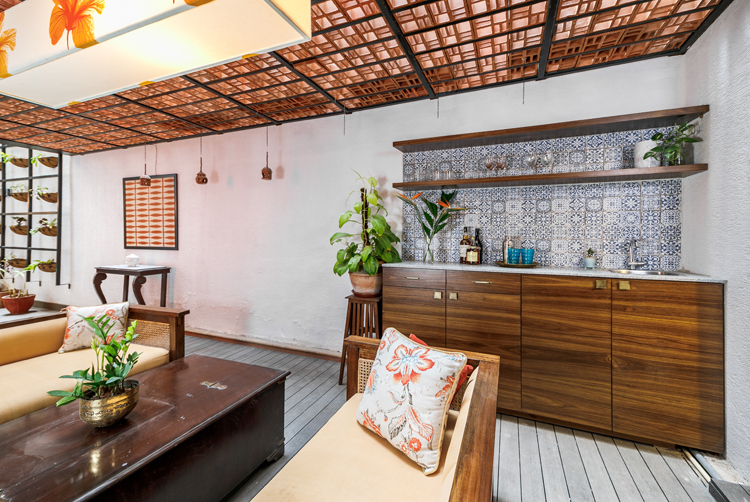 Another contrarian approach here….normally you’d want to separate larger pieces to visually lighten the space. 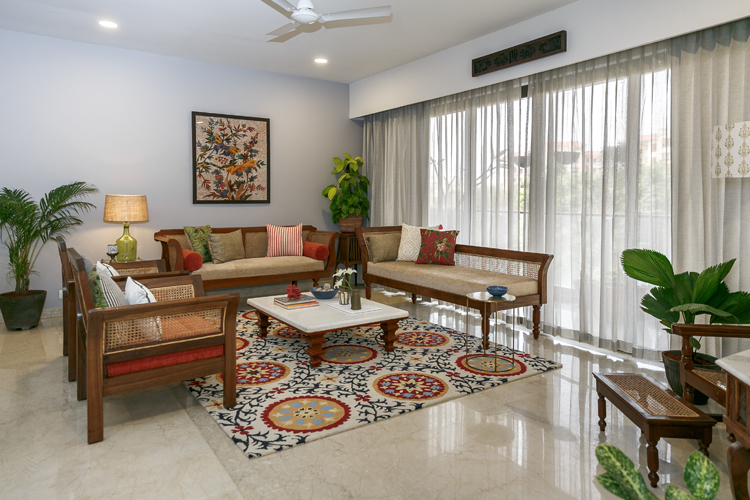 But actually grouping them together creates that visual impact and also leaves more open floor space! 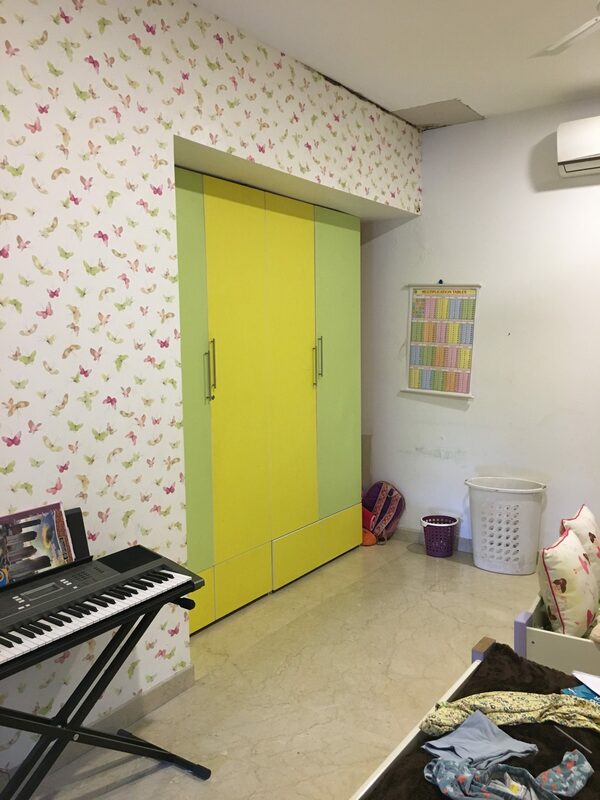 We started with a white room, butterfly wallpaper and wardrobes that were green and yellow. 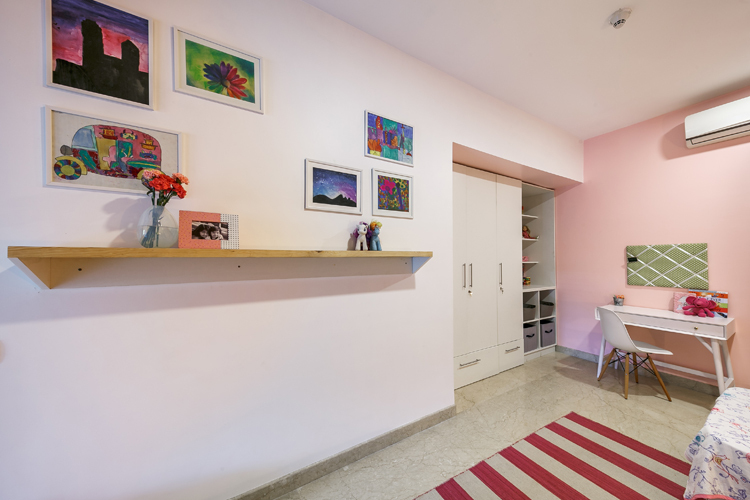 We decided to paint over in a pretty shade of pink (summer pink from asian paints) on two sides and leave one side white, to let the pink pop! The wardrobes got refinished white and we added drawers at the bottom. 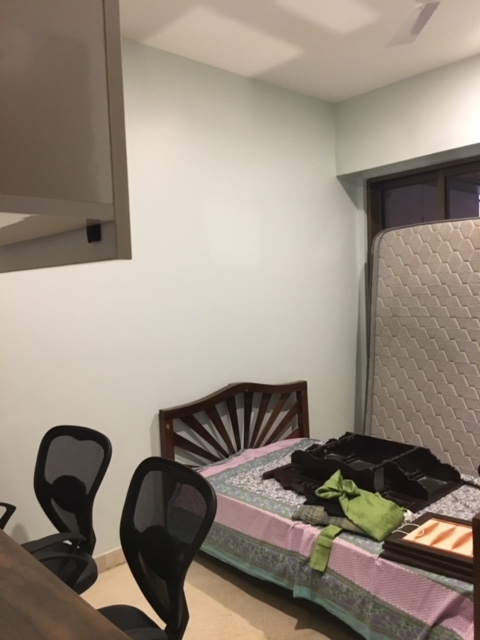 On the far end of the wardrobe to utilize the space better we added a simple white built in shelving unit to hold books, toys, arts & crafts material etc. The furniture in the room is simple and modern! 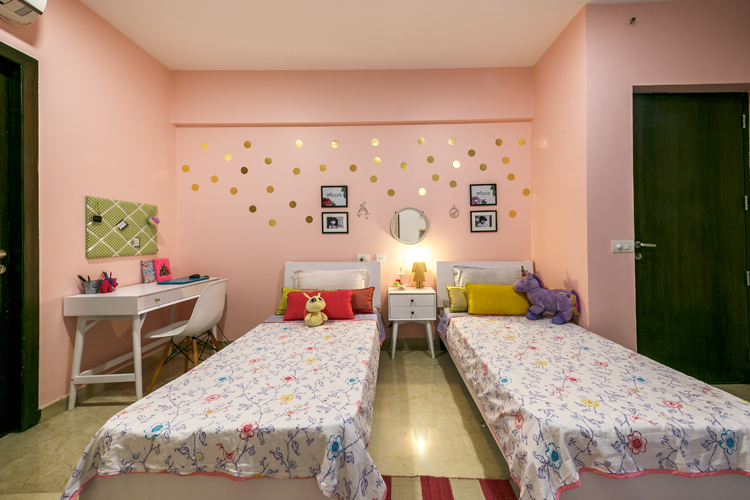 White midcentury inspired beds and desks from Asian Arts and simple white eames replica desk chairs from Urban Ladder. 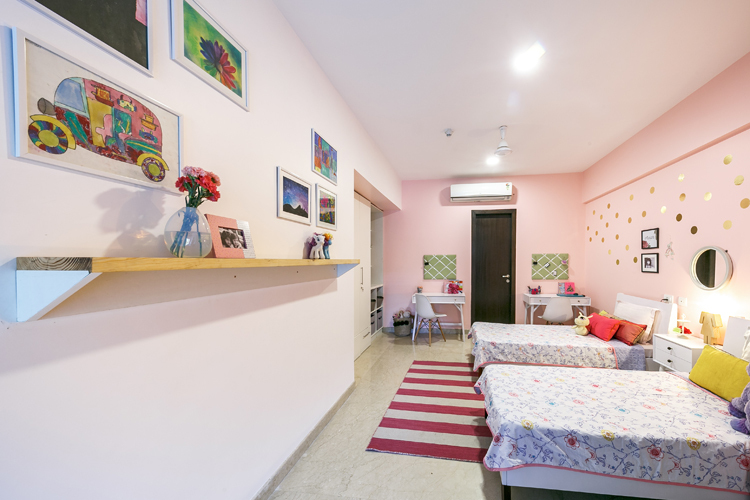 It totally freshens up the space and makes it feel lighter and brighter! We added a small nightstand in the middle and one of my favorite accessories in the room is the little girl shaped wood lamp from Purple Turtles…so unexpected and cute! We added polka dot decals in gold on the wall above the bed and personalized the beds with simple black and white photographs of the kids and their name prints that I got custom made from Kookinuts on Etsy. 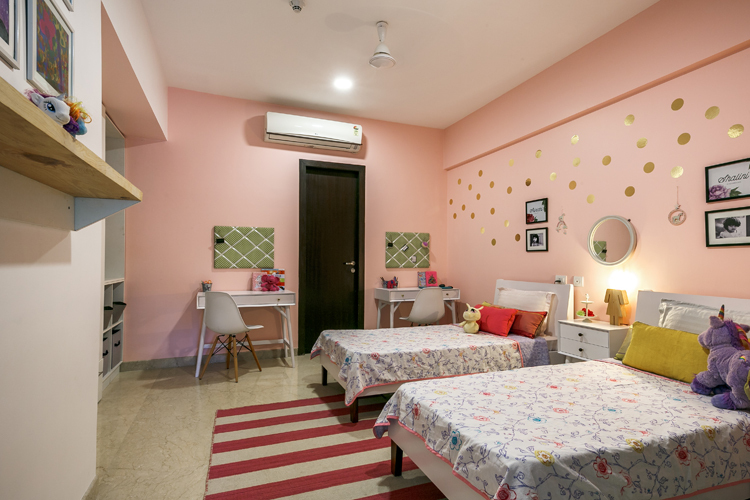 We added a simple bold striped rug from Jaipur rugs in white and fuschia under the beds. 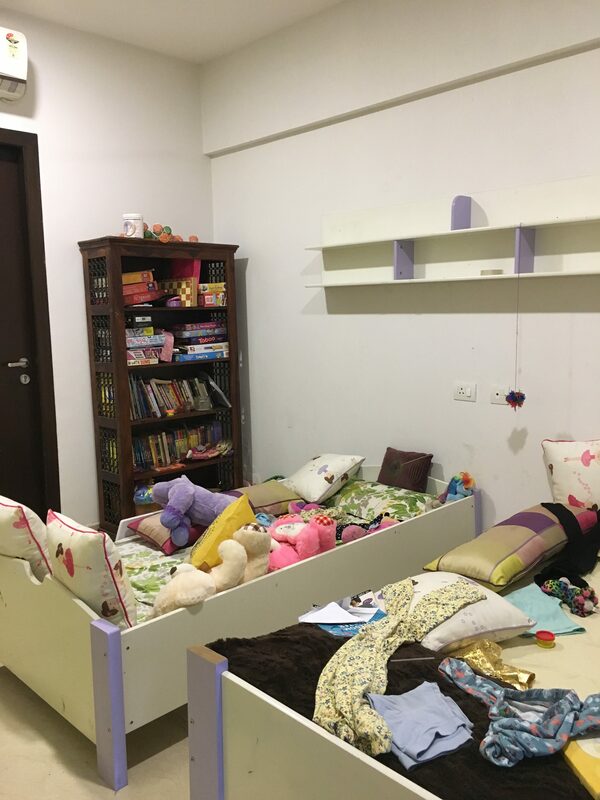 The girls also wanted their own desks and we hung polka dot pin boards from the Wishing chair above each of their desks to give them a spot to pin their stuff! Since both the girls loved art we thought what better art for the room than their own artwork framed. 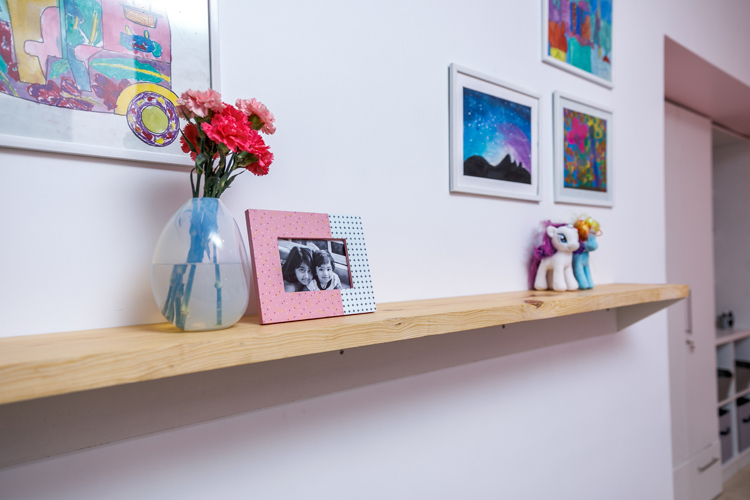 We added a simple natural wood ledge to display photographs and art and created a gallery wall of their artworks above that. I love how this turned out…so simple but so much impact! 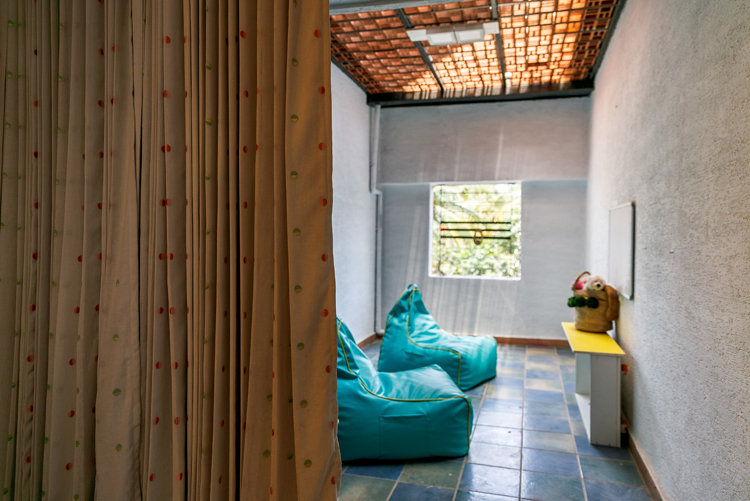 Lastly the girls had a little terrace outside that we dressed up with simple beanbags and a little area for arts and crafts. 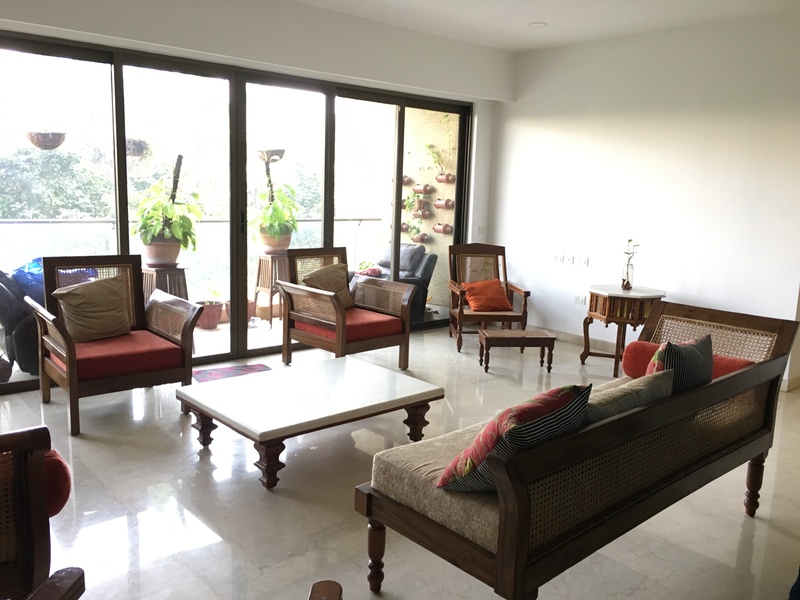 Such a transformation this space has undergone! I loved working on this project and my favorite thing was how we have worked on every different space but kept in line with the character of the house! I hope you enjoyed this walk through! For more pics and updates check out our portfolio section and follow us on Instagram! All sources linked and pics by the amazing Matrioshka Media. 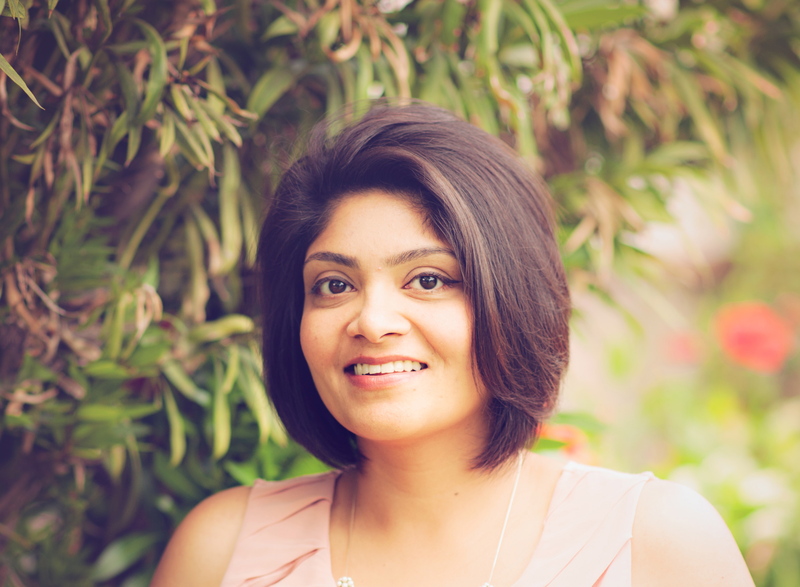 WeeArt Wednesday – Himalayan Plants from Calcuttan! I can’t think of anyone who doesn’t love greenery and plants! If you thought the only way to bring some green into your home was through houseplants or faux greens, think again! 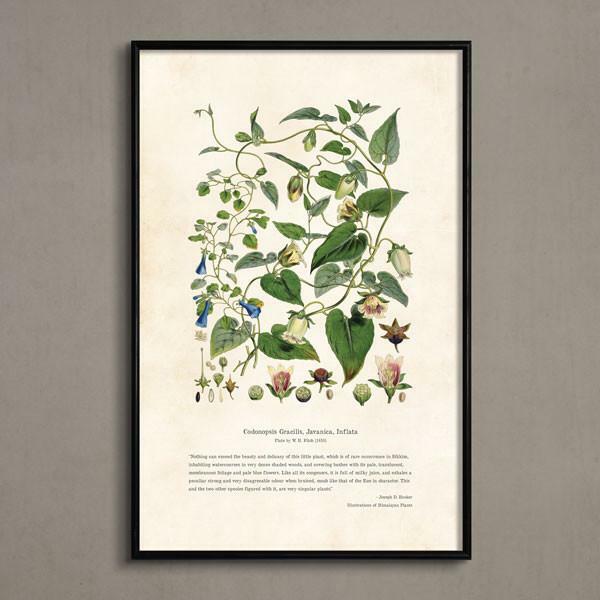 The ‘Himalayan’ series of botanical illustrations available on the Calcuttan website are so exquisite! I love having a couple of these prints framed above a bed or a series of them in your living/ dining room to bring in some calm serene vibes. I’ve picked two of my favorites, but they have a whole lot more! I have always been drawn to photography! There’s something about looking at a real piece of work, a picture of what really exists! I’m partial to black and white photographs and one of my favorite DIY projects was a simple gallery wall of our own travel pics that I framed as art! But bold bright color in photographs are perfect for a punch on a gallery wall or to frame a vignette or a corner in your home. 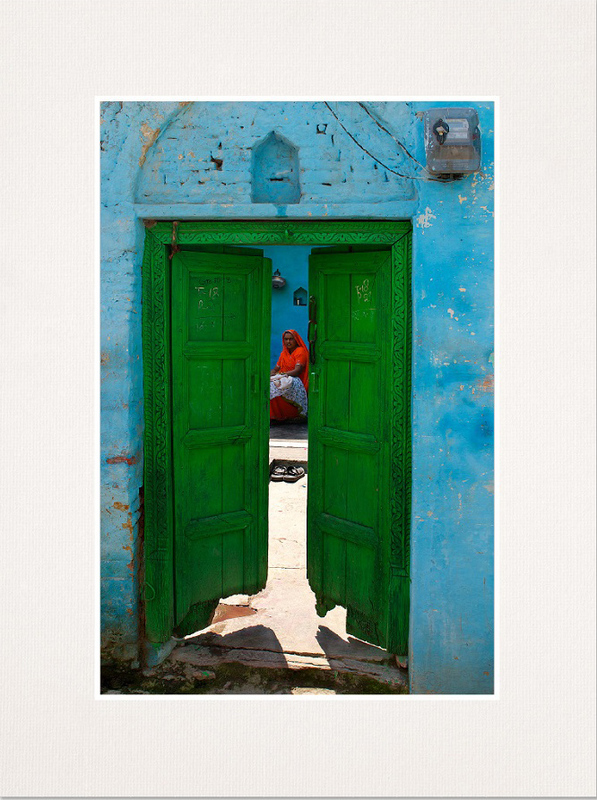 And this beautiful shot of an open doorway jumped at me when I saw it! The bold colors, the imagery and the intrigue is so beautiful! Frame it with a large white mat and sleek black frame for a simple chic look or try a metal frame in silver for a little more punch! Click here to buy this photo print. It comes in a standard 12×18 size. Its been a while since I shared my art picks and since a lot of you voted yes, I decided to get it going again. My pick today is this print by artist Lynne Millar for Jenny’s Print shop! I have long admired Jenny Komenda’s style and love so many of the prints in her shop! 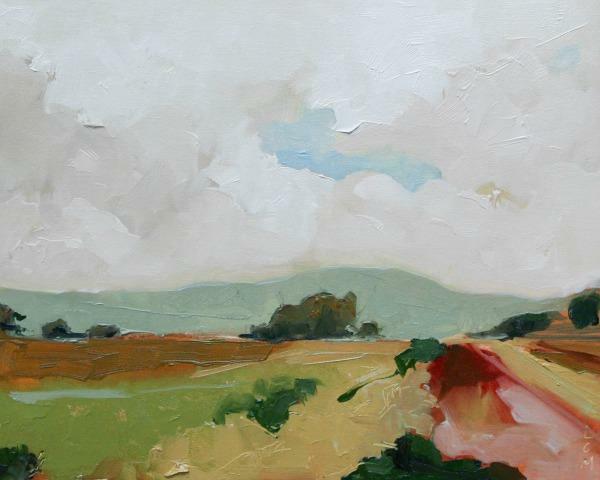 This print by Lynne Millar is characteristic of her nature inspired art and use of color! I love the landscape and the colors and how versatile this print can be! 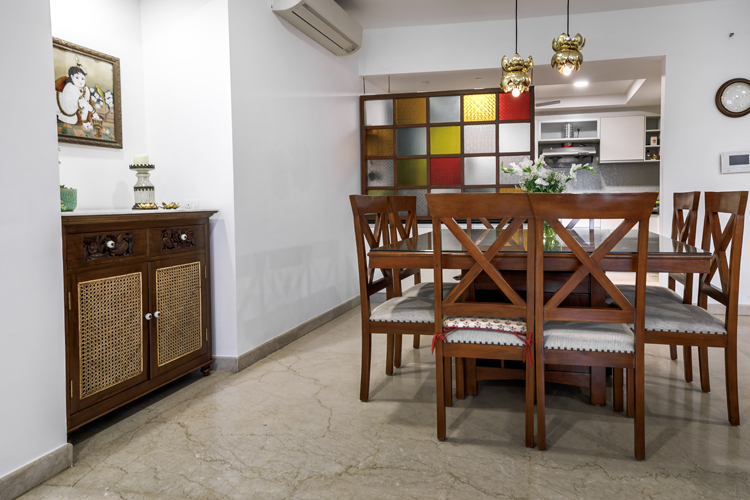 It lends itself to use in pretty much any room in your home and has such a calm vibe about it. The colors are pastel with a little depth in pops…so perfect! And you can’t beat how easy it is to buy! 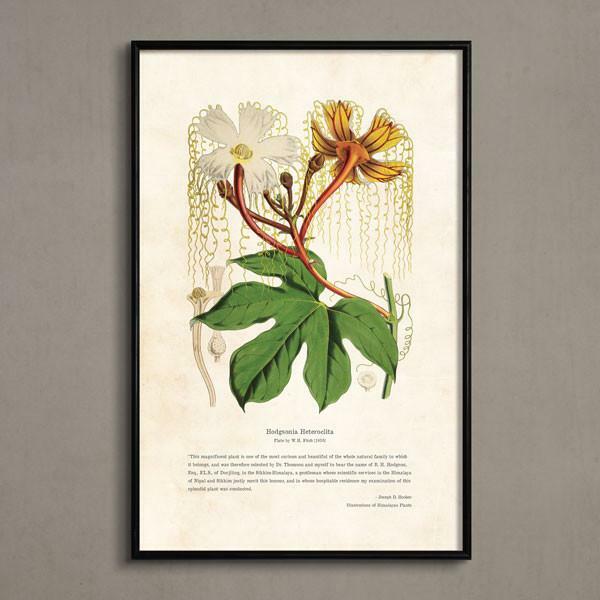 Buy, download and print at your nearest printer…sizes go up to as large as 24×36 that is great for a large wall or as small as an 8×10 in a simple frame styled on a shelf! Let me know if you are looking for any specific kind of art in some area of your home – send us an email or DM me on instagram and I’ll try to incorporate into my future picks.